One thing that majorly differentiates Mahabharata from Ramayana is the fact that the former has a lot many characters with intricate level of relations and loyalties. Further each character has a very definite role to play which is revealed in the Mahakavya at an opportune moment. All this made Mahabharata complex and not so easy to understand for many. Well, that’s a general consensus about the epic: a complex plot with a web of characters and each of them having different layers to it. So in an effort to quench thirst of inquisition about the epic one can buy ‘The Chronicles of Aryavarta’. 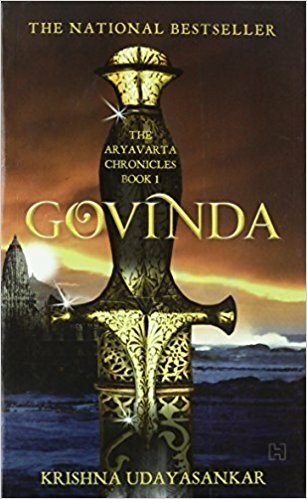 Consisting of three books: Govinda, Kauravas and Kurukshetra the novel is a description of the events as they took place in Aryavarta (consisting of North, Central, East and West India) (never understood the neglect of South India in Indian History). Initially in the preface the author gives an insight into her mind while penning down this book. She considers this work a logical interpretations to the symbolic happenings as mentioned in the original work of Vyas. As the occurrences were passed from one generation to the other the events acquired more of mysticism and heroism around them and ordinary people who did extra ordinary karma became legends. So according to the author Krishna Udayshankar there is a need to see through this veil of mysticism into the events as they occurred- as the tagline says the epic as never told before. The book basically sets two clans against each other: the Firstborn and Fire Wrights. The Firstborn represent the philosophical side of the life while the Fire Wrights are the known for their materialistic prowess, an expertise in knowledge of weapon making. They worked side by side and contributed to the fortunes of Aryavarta. But due to some events the Firstborns decide to destroy the whole lineage of Fire wrights. There is again a more closed group among them, The Secret Keepers who pass on the knowledge (or some secret) of the FireWrigts to the next generation. All this in the backdrop there is race among the vassals to rule over the Aryavarta. But will they succeed with a tyrant like Jarasandh commanding their loyalty? Will the true lineage of the First born again reign over the kingdom? Was the massacre of FireWrights justified? Were they really evil? There are answers. Some very obvious and some very obscured. The problem with the number of characters continues and one might have to keep up with that. But then always remember each one of them is there for a particular reason which will be revealed sooner or later. At the center of this storm there are the heroes the Pandavas, the Kauravas and other legendary characters we are familiar about. But the one that stands apart from everyone else and makes the title of the first book is Govind Shauri aka Krishna. There is always an aura of secrecy and numinosity about this character which is nicely depicted by the author. His dialogues are crisp and will definitely make you note down a few of them in your notebook. A political genius as always been referred to, the story clearly brings out the best out of him. His role in marriage alliances, wars, peace and his dispassionate delivery of philosophical thoughts make him the unchallenged protagonist of the book among the hordes of other powerful characters. Another character that will definitely impress the readers is that of Panchali aka Draupadi. She stands for the feminist side in male dominated patriarchal society. There is a lot of geography involved and that gives the novel an authentic feel. The story will make you look at the map given in the starting of the book a number of times with all the places and ancient kingdom with their terrain qualities clearly marked. Prominent characters are generally referred by their second name like Govind for Krishna, Partha for Arjun, Dharma for Yudhishtir and Panchali for Draupadi. This definitely does bring about a sense of subtleness in the inspiration from Mahabharata. Another notable feature is the human like behavior of the characters whom we always have considered god-like. The inherent flaws in the characters of Pandavas like sticking too much to what Yudhishtir says and his love for betting are nicely brought up. Among all the iconic scenes, the scene of coronation of Yudhishtir stands apart for its lofty presence of all central characters at one place and the dual between two prominent characters with your favorite character winning it (any guesses). You will be really excited to pick up the second book after the events that startled you at the climax of the first one. You must be really looking forward to the detailing of two particular scenes - the betting game between Pandavas and Kauravas and the final war of Mahabharata. With no supernatural occurrences allowed, we hope the author does a good job in justifying the happenings.